The European Stonechat Saxicola rubicola is a small passerine bird that was formerly classed as a member of the thrush family Turdidae but is now more generally considered to be an Old World flycatcher, family Muscicapidae. They, with similar small species in the family, are often called chats. It is a partially migratory insectivorous species. Two ill-defined (doubtfully distinct) races are accepted, the European race S. r. rubicola in the south and east of its range, and the Atlantic coastal race S. r. hibernans in the west and northwest. Together, these two races are found throughout western, central and southern Europe, the extreme northwest of Africa and western Turkey. European Stonechats breed in heathland, coastal dunes and rough grassland with scattered small shrubs and bramble, open gorse, tussocks or heather. They are non-migratory or short-distance migrants, with part of the population moving south to winter further south in Europe and more widely in north Africa. The scientific name rubicola ("rubus dweller") refers to one of its favoured habitats, brambles (Rubus). 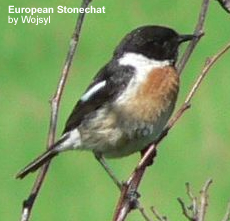 The European Stonechat is somewhat smaller than the European Robin. Both sexes have distinctively short wings, shorter than those of the more migratory Whinchat and Siberian Stonechat. The summer male rubicola has black upperparts, a black head, an orange throat and breast, and a white belly and vent. It also has white patches on the sides of its neck, a small white scapular patch on the wings, and a very small white patch on the rump often streaked with black. The female has paler brown upperparts and head, and no white neck patches, rump or belly, these areas being streaked dark brown on paler brown, the only white being the scapular patch on the wings and even this often being buffy-white. The male has a clicking call like stones knocking together, for which it was named. The song is high and twittering like a Dunnock. In the past, the first two of these were generally considered conspecific (of, or belonging to, the same species) with European Stonechat, being listed as the Common Stonechat Saxicola torquata, but recent genetic evidence (Urquhart and Bowley 2002) strongly supports their separation into distinct species.